The sixth batch of 3,489 Amarnath pilgrims today left Jammu for the 3,888-metre-high cave shrine in south Kashmir Himalayas, amid tight security, a senior official said. The pilgrims, including 774 women and 237 sadhus, left for the cave shrine in 114 vehicles from the Bhagwati Nagar base camp here at 2:30 am, he said. So far, 36,366 pilgrims have visited the cave shrine by taking the 36-km Pahalgam track in Anantnag district and 12-km Baltal route in Ganderbal since the commencement of the annual 60-day pilgrimage on June 28, officials said. The 3,489 pilgrims are expected to reach the Baltal and Pahalgam base camps in the Valley later in the day, the police official said. He said 2,252 pilgrims left in 69 vehicles for the Pahalgam base camp and 1,237 in 45 vehicles for the Baltal base camp, they said. 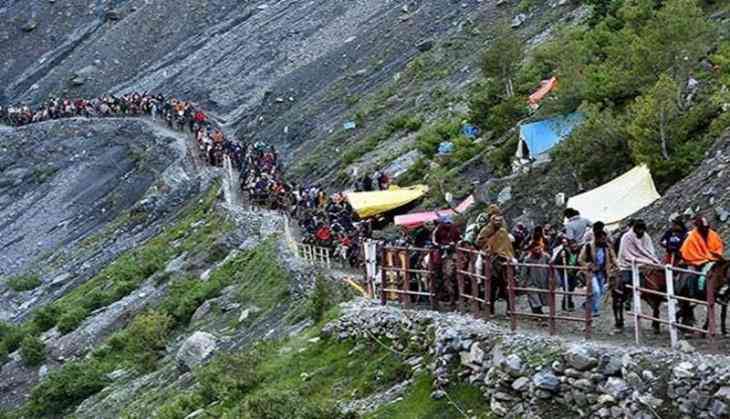 The official said with today's batch, 23,718 pilgrims have left for the cave shrine from the Jammu base camp. Notwithstanding incessant rains and threat of flash floods in the Valley, the yatra to the shrine commenced as per scheduled on June 28 after several hours of delay. The 60-day yatra will conclude on August 26 coinciding with 'Raksha Bandhan'.